Crickets are omnivorous scavengers who feed on organic materials, including decaying plant material, fungi, and some seedling plants. Cricket droppings look like black pebbles and are often mistaken for termite droppings. Crickets are very common here in Las Vegas, North Las Vegas, Henderson, and Boulder City, NV. Earwigs are a very common indoor pest in Las Vegas, North Las Vegas, Henderson, and Boulder City, NV. Earwigs hide in small, moist crevices during the day and are active at night. Earwigs feed on a wide variety of insects and plants. Damage to foliage, flowers, and various crops is commonly blamed on earwigs. Silverfish feed on items such as books, boxes, carpet, clothing, glue, paper, cotton, and silk. These products contain starches and adhesives which silverfish like to eat. 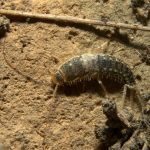 Silverfish can live for a year or more without eating. Silverfish are considered household pests, due to their consumption and destruction of property. Grain weevils, flour beetles, and grain moths are common pests in Las Vegas, North Las Vegas, Henderson, and Boulder City, NV homes or business kitchen cabinets. These pests infest flour, grains, cereal, pasta, rice, etc. The infested products must be thrown away and pesticides should be used to treat the infested areas to kill off the grain moths, grain weevils, beetles, and eggs that are left behind. Agent Pest Control has the knowledge and training to get rid of stored product pests. PEST CONTROLThe Las Vegas valley has a variety of pests. While some are less common than others, they still pose health and safety hazards and must be dealt with.